Here are some reasons why you might need to update your home’s plumbing. Even if your home isn’t that old, the plumbing in it may need an upgrade. You shouldn’t have to be unhappy or uncomfortable in your home, especially in the bathroom. Here are some reasons why you might need to update your home’s plumbing. One of the biggest reasons you need to upgrade your bathroom plumbing is a problem with the fixtures. The showerhead on the wall may be rusting, and not dispensing water as it should. Or it is leaking so badly that when you switch from the faucet to the showerhead, it doesn’t work. Let’s say that the adjustable showerhead you installed came off of the wall. That’s a huge headache as well. If you are looking to fix any of the fixtures by yourself, then be sure to switch off your home’s water supply temporarily. That said, if you’re not sure how to do any of this, it might be better to rely on the professionals. Another reason you need to update your plumbing is when you encounter issues with your water. Leaks can cause your water bill to skyrocket, or lead to mold and mildew growth. 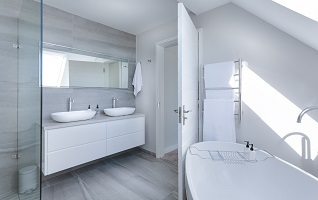 Drainage and blockage problems could signal a clog deeper down in your pipes, which are restricting the flow of water into your bathroom or preventing the sink, tub, or toilet from working correctly. You might also need to replace your water line, especially if you are seeing contaminated or dirty water that is both disgusting and potentially dangerous. Over time, your plumbing just won’t work as well. You won’t have as much water pressure as you did before. Sometimes, you can learn to live with it. Something you should never deal with, though, is contaminated water. Maybe the water smells odd when you turn the tap, or you see rust in the water when it comes out. This contamination might not be the fault of the local water treatment plant or the water provided by your local utility. Something could be wrong with your water heater. This entry was posted on Friday, October 19th, 2018 at 12:03 pm. Both comments and pings are currently closed.